The Natural Area known as Parcel 4 is at the corner of Balboa and the Great Highway. 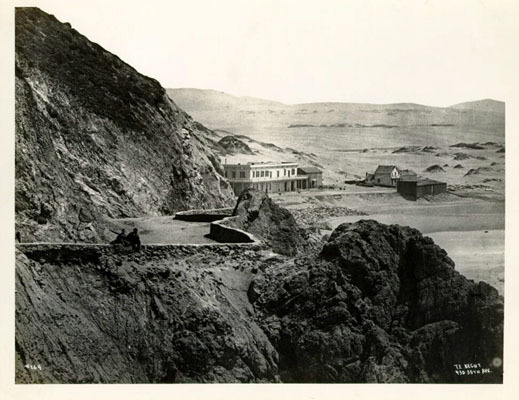 A photograph taken in 1868 of that location indicates that it has been continuously built upon for nearly 150 years. Long-term residents of San Francisco will remember it as the location of Playland by the Beach. 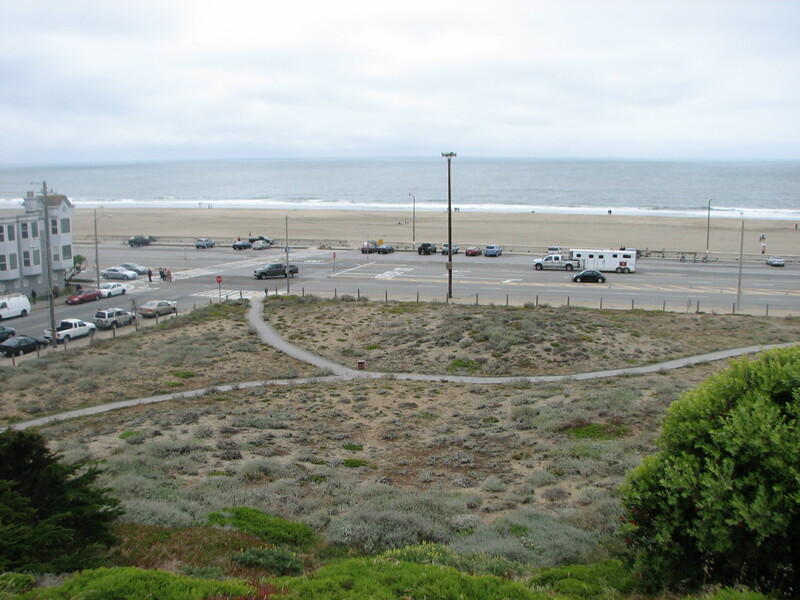 After Playland was closed, the city purchased the property for $3.05 million in 1993 with the intention of putting a sewer pipe under it, then restoring it to dune vegetation. The soil was essentially building rubble, so the city had to buy $47,000 of sand and disk it down 18 inches to amend the soil in preparation for planting dune vegetation. The sand was bulldozed into simulated dune shapes and planted in 2002. 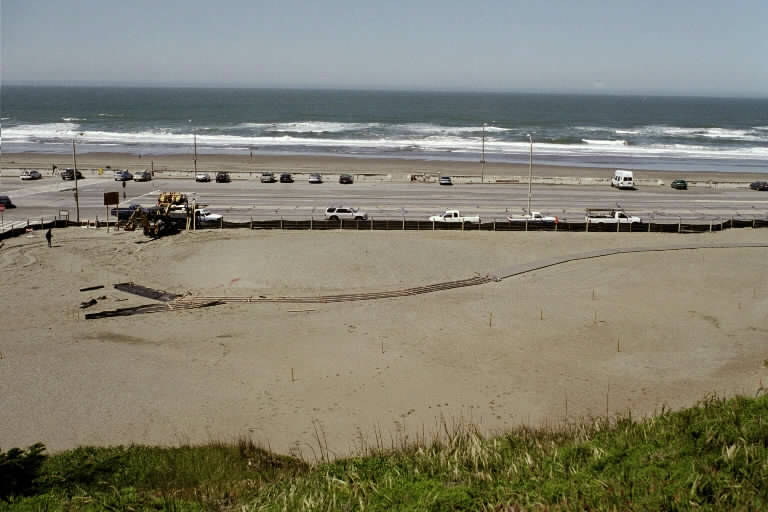 The restoration was described in the newsletter of the Coalition of San Francisco Neighborhoods in April 2003, in an article entitled “Sand Francisco.” Does this sound “natural” to you? India Basin is a Natural Area on the east side of the city, on the bay. The east shore of the city was where most industrial development was located until industry left the city beginning in the 1960s. Much of the soil was landfill. Like Parcel 4, the landfill was bull-dozed into a simulated wetland, hoping to restore tidal action. Native pickle-weed was planted several times in the mud-filled basins. We haven’t visited this area for several years. Perhaps they have finally been successful in that effort. This is what we found there on our last visit: native plants along the trail, surrounded by plastic and woodchips to discourage weeds and huge, empty, mud basins off shore. It didn’t look natural to us. Many of the Natural Areas in San Francisco are less artificial than these two extreme examples. Some of the Natural Areas weren’t built upon in the past, but had no native plants in them when they were designated as Natural Areas. Pine Lake is an example of such a Natural Area. Even where native plants actually existed, their populations were small and isolated in comparison to the acreage designated as a Natural Area. Over 1,000 acres of city-managed parkland have been designated as Natural Areas, 25% of all parkland in San Francisco and 33% if Pacifica is included in the calculation. Now we will visit the Albany Bulb for contrast. 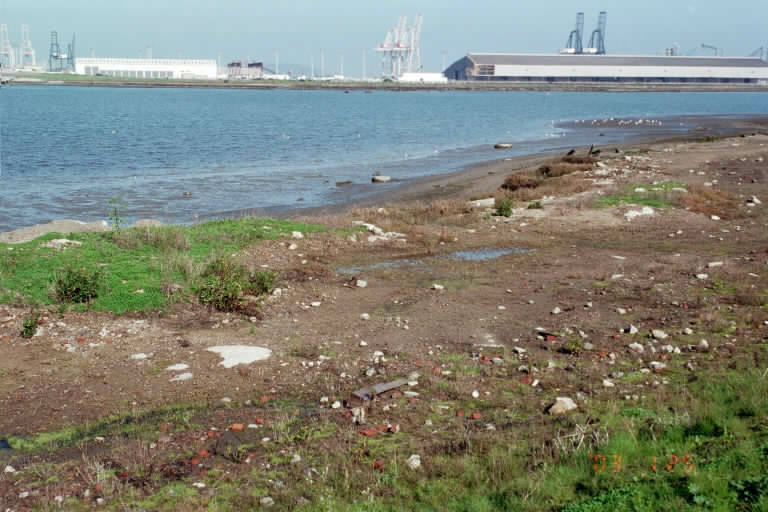 Albany Bulb is also landfill that was for many years the Albany city dump. When the dump was closed, the Bulb became a park. It is a wild and wonderful place. There are few native plants, other than the ubiquitous coyote bush that seems to thrive almost anywhere. 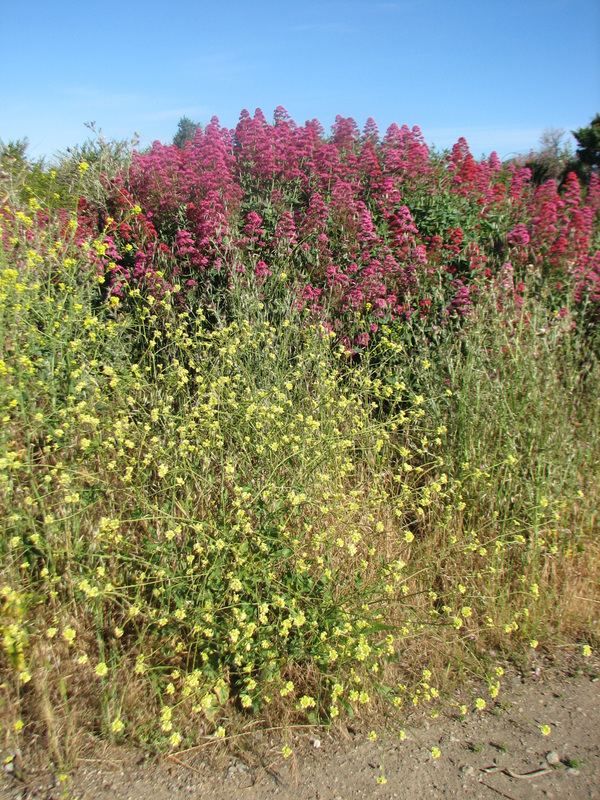 In the spring, Albany Bulb is a riot of color. These are the competitive non-natives that native plant advocates wring their hands about. They are there because they are best adapted to the current conditions in this location…the heavily amended soil, the higher levels of CO₂, the warmer climate, the use by humans and their animal companions. Valerian and wild mustard, Albany Bulb. Both are non-native plants. 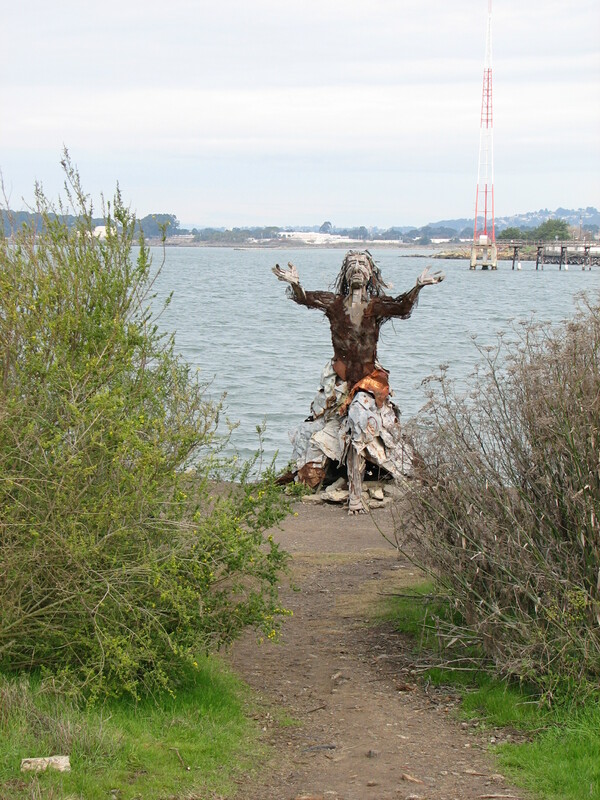 The figure with the wild radish reminds me of the fantastic driftwood sculpture that used to appear in the mud flats at the eastern end of the Bay Bridge. I’m sure that Snoopy on his doghouse in a life and death battle with the Red Baron was not native to the area, but it raised my spirits every time I saw it. Yes, BB, I remember those sculptures as well. And if you are nostalgic for them, you can see their descendants on the Albany Bulb where “junk” art has migrated. That’s art made from junk, not junky art.